Grains, Legumes, Nuts, & Seeds are all plant seeds. They all have the potential to grow into full plants in the right conditions. Grains & Legumes make up the majority of the modern human diet. They also contribute to the decline in overall health and many of our most common ailments and deficiencies. We have been taught for generations that these are an important part of a healthy diet (whole grains, of course). The truth is they are awful for you. Grains are a fairly recent addition to the human diet when you look at the timeline of human existence. It is only in the last 10,000 years out of 2 million that the agricultural age began and grains were introduced as a primary source of food. Prior to this time, we simply did not eat them. They were not considered a source of food. They were very small, much smaller than what we see today, with little nutritional value. They were the first to be “genetically modified” or bred for larger grain sizes. That should be our first clue to steer clear of them. What about evolution, you ask? Shouldn’t we have evolved to be able to eat them? Yes and no. It is true that we have begun to evolve to where we can tolerate them. Depending on where your ancestors come from determines whether you are more prone to intolerance to the anti-nutrients within the grains we eat. When you do the simple math, you find that it’s not so unbelievable that we haven’t evolved much with this new addition. When you consider 10,000 years in the span of 2 million, it is only .005%. Look at it from another perspective. Assume you live to be 70 years old. That’s 25,550 days and 613,200 hours. If you take .005% of that, you’ve got 1.2775 days and 30.66 hours. Think about how much of a difference one day of your diet makes on your overall health and personal body evolution in the span of 70 years. Not much, right? There is also the perspective that not all evolution is for the better. We evolve to adapt, but sometimes that adaptation is not for the better. For example, prior to eating grains, based on fossilized records, tooth decay, digestive disorders, heart disease, cancer, diabetes, and osteoporosis were not found. When you look at the past 50-100 years, you can see a significant increase in these diseases which directly correlates to the increase in eating sugar, dairy, grains, legumes, and processed foods. Furthermore, if you look solely at the nutritional effects of eating grains, you quickly find that they truly do cause more harm than good. Let’s start by looking at the digestion of grains. Grains cannot be eaten without first cooking them, because they are indigestible in raw form. They also contain high levels of anti-nutrients which essentially do not allow for digestion and leech essential nutrients preventing you from utilizing them and often are the cause of autoimmune and digestive disorders. Still not convinced? Consider this: as stated in Unglued: The Sticky Truth (I highly recommend the entire article), “wheat flour is used to make glues for book binding and wall-papering, as well as being the key ingredient for paper mache mortar. Sticky soy protein has replaced the need for formaldehyde based adhesives for making plywood, and is used to make plastic, composite and many other things you probably wouldn’t consider eating.” Let’s face it, glue in the intestines causes damage to your intestinal walls, allowing pathogens and anti-nutrients to escape into a systemic susceptibility. It’s just not a good idea. So then the question arises….what about sustainability? This poses an important question. It is true that we may not be able to sustain our current world population if we returned to a no grain, no legume, and no dairy or large animal diet. The worst part is we created this debacle due to the beginning of the agricultural age when we began eating these in the first place. It allowed for rapid population growth due to a relatively cheap and plentiful, local source of food. We have expanded beyond what our resources can tolerate, and we are wasteful. However, there are some proven sustainable farming methods, and many of these farmers are actively pursuing a global return to this method. It is important to preserve long-term health. You may be wondering what to eat if it’s not grains. Don’t worry. There are a lot of options that are both healthier, and tastier. Please see the Substitutes and Recipes pages for more details. Personally, I choose not to eat grains and legumes as a regular source of food. It makes up a very small portion of my diet, and certainly is not in my daily diet. I save it for rare occasions. When I have been suffering from Candida, and certainly if I ended up on long term antibiotics again, I would avoid them entirely. When I do eliminate them from my diet, I feel so much better. It is incredibly noticeable. Legumes and beans are similar to grains in that they were introduced into our diet fairly recently and they contain anti-nutrients that effect digestion. Some of these anti-nutrients are highly toxic like Cyanogens (Cyanide) which are found in all legumes and have actually been the cause of food poisoning in many instances. Lima Beans in particular have very high levels. Soy should be avoided due to its tendency to alter hormonal balance and thyroid function, particularly in women. There have been many recent studies showing the adverse effects of Soy. I recommend doing a little research on this. There is more than I can cover here, but this article will get you started (Soy & Estrogen Dominance). Nuts and Seeds are little blessings from Nature’s Pantry. They are kind of like nature’s “Meals Ready to Eat” (MRE’S). If you stop to think about it, they contain all that is needed to grow a plant or tree. These tiny little snacks are full of vitamins, minerals, essential fats, protein, fiber, oh my! You would almost think you could just eat nuts and survive. Not quite. Nuts & Seeds need to be treated with the respect they deserve. Our ancestors didn’t eat nuts by the handful. And, they had to crack it out of its shell first! They are not meant to be guzzled down like a bag of potato chips or a pint of ice cream. A small handful will do. Eat them slowly, chew thoroughly. On top of that, you may want to soak them first. Soak them? That’s right, soak them. 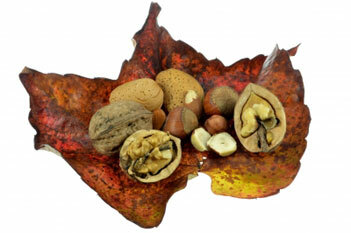 Sadly, Nuts and Seeds (along with grains and legumes) contain what is called anti-nutrients. These anti-nutrients prevent your body from digesting food properly, and from absorbing essential nutrients. Most of these anti-nutrients can be reduced by cooking, soaking, sprouting, or fermenting, but not completely eliminated. These can cause sensitivities, which is why some people develop gluten intolerance, nut allergies, Celiac Disease, Irritable Bowel Syndrome, Leaky Gut Syndrome, and others. So why eat them at all? Nuts and Seeds in particular offer a great deal of benefit and contain smaller amounts of phytates or phytic acid. Soaking them with salt in water neutralizes enzyme inhibitors, promotes beneficial enzymes, and increases bioavailability. Plus, they just taste better! It is important to do this method correctly, and to dry them properly to prevent mold growth (see Proper Preparation on the Anti-Nutrients page). Note: Peanuts are legumes. Cashews and Pistachios tend to have high mold content. Caution should be used. This is a tough one for me, especially because I was a vegetarian for 15+ years. With the research I’ve found, I don’t see how it can be sustainable for long term health. Sure, we need to eat a lot less meat than we are used to, and we could probably even do without eating the large domesticated animals that our ancestors didn’t eat. BUT…..the only significant source of protein for a vegetarian is going to come from grains and legumes. If it is health you are after, this is not the way to go. If it is a moral thing, which I can completely relate to, buy organic and/or humanely raised animals…..there’s your answer! As always, it is a personal choice. Nuts and Seeds are a powerful source of nutrients and deserve respect. What's the Problem with Grains?